David Baldacci has 1 media appearance. A Conspiracy Around Every Corner In Baldacci's D.C.
With over 110 million copies of his novels in print, David Baldacci is one of the most widely read storytellers in the world. Now he introduces a startling, original new character: a man with perfect memory who must solve his own family's murder. Memory Man Amos Decker's life changed forever--twice. The first time was on the gridiron. A big, towering athlete, he was the only person from his hometown of Burlington ever to go pro. But his career ended before it had a chance to begin. On his very first play, a violent helmet-to-helmet collision knocked him off the field for good, and left him with an improbable side effect--he can never forget anything. The second time was at home nearly two decades later. Now a police detective, Decker returned from a stakeout one evening and entered a nightmare--his wife, young daughter, and brother-in-law had been murdered.His family destroyed, their killer's identity as mysterious as the motive behind the crime, and unable to forget a single detail from that horrible night, Decker finds his world collapsing around him. He leaves the police force, loses his home, and winds up on the street, taking piecemeal jobs as a private investigator when he can. But over a year later, a man turns himself in to the police and confesses to the murders. At the same time a horrific event nearly brings Burlington to its knees, and Decker is called back in to help with this investigation. Decker also seizes his chance to learn what really happened to his family that night. To uncover the stunning truth, he must use his remarkable gifts and confront the burdens that go along with them. He must endure the memories he would much rather forget. And he may have to make the ultimate sacrifice. Memory Man will stay with you long after the turn of the final page. 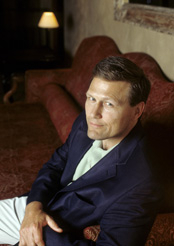 David Baldacci (b. 1960 in Richmond, Virginia) is a bestselling American novelist. Baldacci received a B.A. from Virginia Commonwealth University and a law degree from the University of Virginia. As a student, Baldacci wrote short stories in his spare time, and later practiced law for nine years near Washington, D.C.. While living in Alexandria, Virginia, Baldacci wrote short stories and screenplays without much success. In despair, he turned to novel writing, taking three years to write Absolute Power. It took Baldacci two years to get the book published, but when it finally did hit the shelves in 1996 it was an international best seller. David Baldacci serves as a national ambassador for the National Multiple Sclerosis Society and participates in numerous charities as well as founding his own foundation for literacy, Wish You Well Foundation. Baldacci was raised in Virginia and still resides there (in Vienna, Virginia) with his wife, Michelle A. Collin-Baldacci (Mikki), and two children. His cousin is the Democratic Governor of Maine John Baldacci, first elected in 2002 and re-elected in 2006. David Baldacci is currently considered a "single author." If one or more works are by a distinct, homonymous authors, go ahead and split the author. David Baldacci is composed of 23 names. You can examine and separate out names.